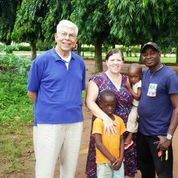 Several years ago Archbishop Augustine Akubeze from the Diocese of Benin City, Nigeria, came for a visit to ask for assistance in building a medical clinic for the Igbogor Village which is outside Benin City. This village is in the northern section of the Archdiocese and has a population of over 400,000 with no medical facilities to serve this population. The most critical need is to provide a safe place for delivering babies and providing after care for mother and child. The second most critical need is emergency care for the sick and elderly of the area. 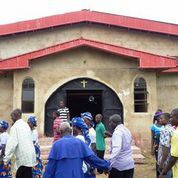 My self along with several priests from Nigeria, Dr. Curtis Stokes and his wife went to visit the Archdiocese of Benin City and to visit the Igbogor Village area. Our concern was the sustainability of the project with resources and manpower. All were very impressed with the planning for this project by the Archdiocese and we learned that the facility would be operated by the Medical Missionaries of Mary Sister. 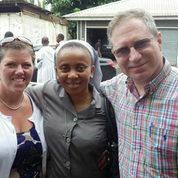 (My aunt was a Medical Missionary of Mary sister and worked in Nigeria, and on this trip I was able to meet two sisters that actually worked with my aunt!) The total cost of this project is about one million dollars. Our best hope to raise the funds for this project is through grants from foundations. Any leads in applying for funding for this project is greatly appreciated!! Not long ago someone asked me why I did this work for the missions, especially since I have a parish and several other responsibilities to my Diocese. It was a good question and after some thought and reflecting on my mission experiences over the last ten years, I realized how much my mission experiences added to my work as a priest. In fact the mission work invigorated me for my parish work. I will never forget the most affirming words ever spoken to me as a priest. This happened in a small village on the Island of Vanua Levu (Fiji) when I went to see the progress on the completion of a church which had been under construction for over 12 years. After a two hour ride in an open boat, in and out of storms, we arrived in a very remote location. After a Kava welcoming ceremony the chief spoke to me in English and said; “Thank you for bringing Christ to our village.” I think those words sum up the work of the Church, which is to bring Christ to every village of the world.